Santa Clarita Valley Sheriff's Station deputies arrested a woman who had barricaded herself in a Castaic apartment on Friday, Sept. 14, 2018. Photo: Two8Nine Media. 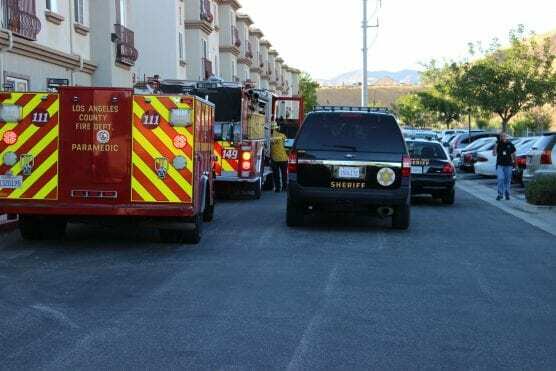 A woman who was barricaded in a Castaic apartment after allegedly firing a gun during a welfare check in Castaic Friday afternoon surrendered to authorities after several hours of negotiation, according to Santa Clarita Valley Sheriff’s Station officials. “Los Angeles County Sheriff’s Department Special Enforcement Bureau and Crisis Negotiation Team members have concluded their tactical response to assist Santa Clarita Valley Sheriff’s Station in the containment of an armed barricaded suspect on the 31000 Castaic Road, Castaic, at approximately 4 p.m., Sept. 14. “Santa Clarita Station deputies responded to the location regarding a call for service to ‘check the welfare’ of a woman who was making criminal threats to the residents in the building. “When deputies approached the location, they heard the sound of one gunshot from inside the apartment. Deputies tactically withdrew and established a containment. The suspect refused to surrender and barricaded herself inside the location. “LASD Mental Evaluation Team, Crisis Negotiations Team, LASD Aero Bureau, and Special Enforcement Bureau units responded to the location. “Approximately three units of nearby apartment buildings were evacuated. Residents from those apartment buildings were safely escorted to the Recreation/Community Center. “Later the residents were safely escorted on a city bus to the Castaic Sports Complex/Aquatic Center where the American Red Cross provided shelter, water and food. “After several hours and verbal attempts by crisis negotiations team members, the suspect to surrender, the suspect exited the residence and surrendered peacefully. “The suspect was arrested and transported to Santa Clarita Valley Sheriff’s Station for booking. “No deputies were injured during this incident. Santa Clarita Valley Sheriff’s Station deputies arrested a woman who had barricaded herself in a Castaic apartment on Friday, Sept. 14, 2018. Photo: Two8Nine Media.